It’s been a few days, and we have some catching up to do. Before departing Geneva on bike, JH, my wonderful host in Geneva, drove me around to a couple of the wineries in his area. We stopped in for a late morning tasting at Fox Run Vineyards and Anthony Road Vineyards. This is the part of the trip where I regret not having the hauling capacity for some bottles of wine (can you imagine how shaken up and sun-scorched they’d get strapped to the back of my bike for a week? ), but at least I’m able to try these tasty beverages. Fox Run had some delicious rieslings and gewurztraminers of both the dry and off-dry varieties. Their whites were nicely balanced on the whole. The complexity of their cabernet franc really wowed me, but the winner of the tasting in my opinion was the reserve cabernet franc. The reserve CF had a pleasant spice both on the nose and on the palate. It’s smokey, finely structured finish with just the right amount of oak and tannin is what sold me the most on it. Definitely one to remember. We also sampled the Fox Run tawny port, which I’m told is made primarily in an Australian port style as opposed to a traditional one (but the host at the winery was unable to elaborate on the meaning of that, so I’m still at a bit of a loss myself). It had the right amount of sweetness and a pleasant nutty note to it, but for whatever reason, there was a fairly intense alcohol/medicinal burn to it that kind of put me off. Moseying on a bit further down route 14, we stopped in at Anthony Road. There we were able to sample the 2005 Tierce dry riesling (a joint effort between Fox Run, Anthony Road, and one other winery that eludes my memory at the moment). I enjoyed this quite a bit. It had a strong mineral/flinty component to it that was balanced out with some good passion fruit notes and a crisp acidity. The Anthony Road Devonian Red (blend of cab franc, pinot noir, and lemberger) also quite surprised me with it’s almost bourbon-esque vanilla nose and clove spice flavor, especially given it’s $10 price point. 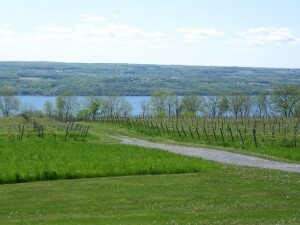 So, with the first two wineries of the tour under my belt, I set off on my bike from Geneva around to the east side of Seneca Lake and on down I went. I passed a few wineries along the way that I thought about stopping in at (the picture above is near Ventosa Vineyards, I believe), but with my late start on the day and the many miles I had yet to go, I limited myself to one stop in at Lamoreaux Landing. At Lamoreaux I mostly sampled their whites, pairing the reserve riesling against the red oak riesling and the dry gewurztraminer against the semi-dry. The reserve riesling had a nice pomaceous crispness and a pleasant minerality. It seemed much more dignified than the red oak riesling, which comes from younger vines. The red oak riesling had a more intense floral nose, and more of a tropical fruit thing going on. Both of the gewurztraminers had a good nose of lychee and rose petal, as well as some good baking spice on the finish. The semi-dry had a fuller body to it, owing to the extra sugar, while the dry felt a little more balanced with its fruit notes on the palate. I also sampled the reserve cabernet franc, which was a beefy, full, rich, red wine that I could see going really well with game meats and barbecue. Dark chocolate and dark fruit on the nose paved the way for some nice dark cherry and baking spice notes on the palate. It finished off with subtle oak and tannins that rounded the whole thing out nicely. The afternoon was getting on, so it was time to figure out where to sleep. 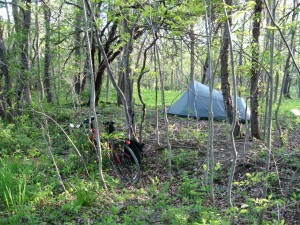 I figured I’d head up to the national forest and set up a tent for the night (I love national forests). It was a beast of a climb getting up there, though. I rode up Ball Diamond Rd from route 414 into the forest and it was an intense climb. It was a three mile long stretch that gained probably 1,500 feet of elevation from the lake’s shore to the forest. I was ready for some rest after that haul. 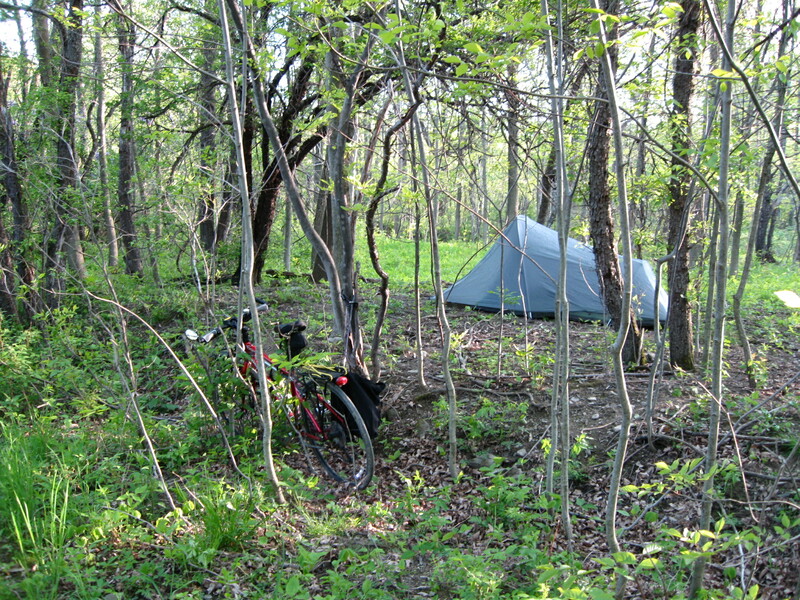 I walked the bike about a mile down the trail and found a nice patch of land for the tent. I was out by nightfall. So I’m relaxing after a long day’s ride in Geneva, NY at the north end of Seneca Lake. 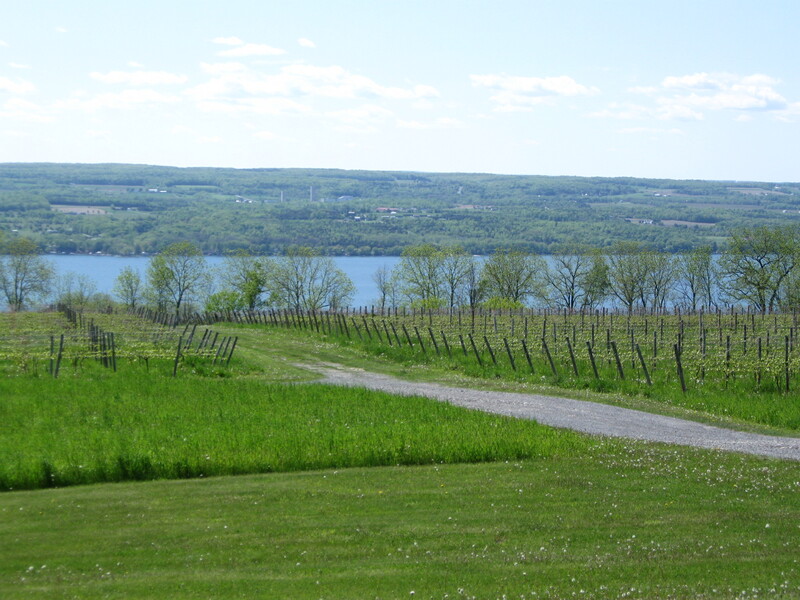 Day one of the Finger Lakes tour is done. Getting out of Rochester wasn’t too shabby. JP, the friend who I’m crashing with there, directed me to a bike path that got me past most of the city roads without difficulty or traffic. On the Erie Canal trail this morning, I encountered a few other cyclists who were great for conversation and helped direct me around some construction detours along the path. 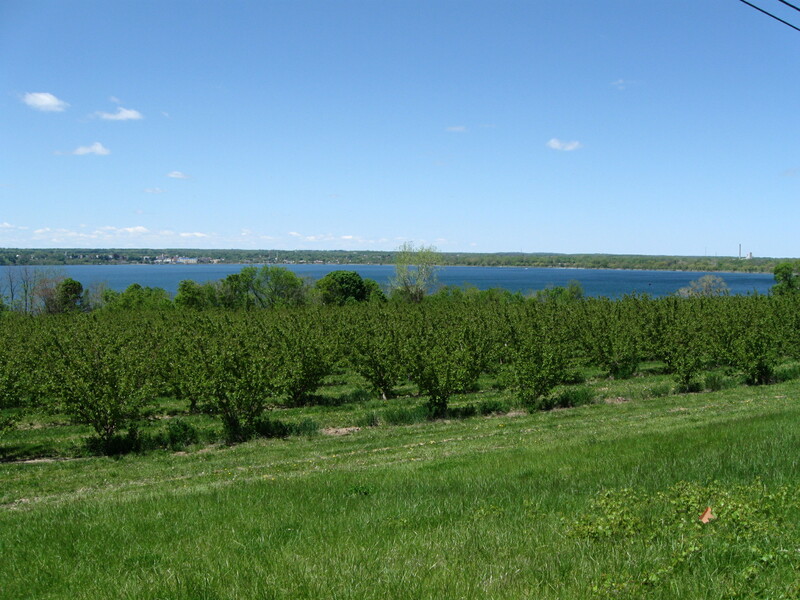 In Pittsford I hopped up off the trail and headed down the road towards Canandaigua. The nice thing about many of the roads in this region of New York is the wide shoulders they have. Many of these roads were not normally roads I would be comfortable biking on (in excess of 40 mph), but thanks to the nearly five feet of shoulder space I had, it was quite pleasant. I was catching a nice breeze from passing cars, but not enough to be bothered by their closeness. 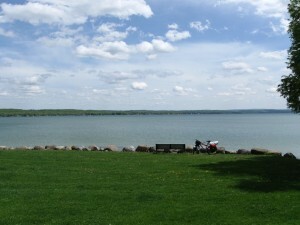 So I stopped in at a park in Canandaigua for some lunch. Check out my view of the lake there. I sat on the park bench relaxing and eating assorted munchables (almonds and raisins, along with a bagel, I think), watching the clear waters and those on it. The water was surprisingly warm, given that it was a relatively chilly day in the area. I took my socks and shoes off and dangled my feet for a few minutes before riding on. From there it was but 15 miles into Geneva. Breakfast was catching up to me in a less than pleasant way, but a gas station pit stop saved the day and I was happily on from there. Geneva is a cool little college town. My generous host and I wandered over to an all you can eat Chinese buffet nearby, and then I got a quick tour of the college grounds. We moseyed on back, and he was kind enough to share with me a bottle of Dr. Konstantin Frank’s 2001 cabernet franc. For a wine as old as this it was surprisingly bright and fruity on the initial taste. It lacked structure and was uninteresting on the finish, at first, but we came back to wine after about an hour, and found the tannins expressing themselves more (which I thought quite odd), and the wine far more balanced and interesting. The fruit had diminshed allowing a little more earth and character to show through. Tomorrow, we’re going to check out a few of the wineries in the Geneva area, and then I have another 35 miles or so of cycling to put in. I’ll likely check in again from Ithaca in a few days time. 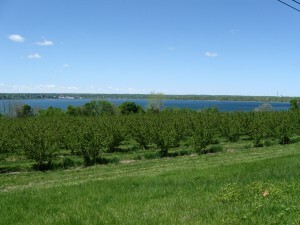 I’ve got some more pictures of Lake Canandaigua beneath the link.